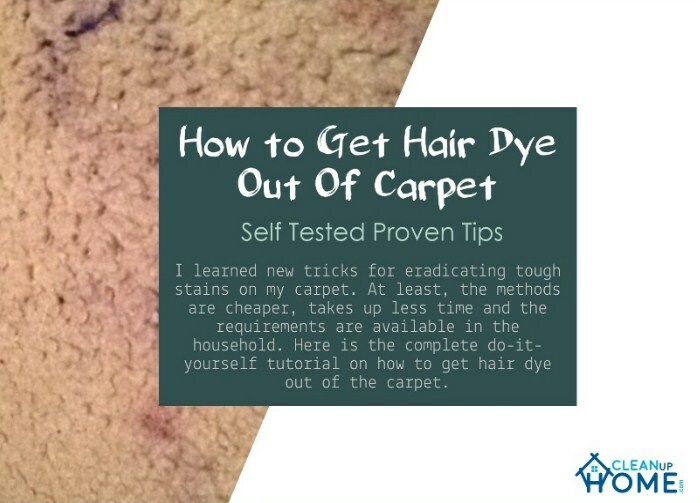 Are you looking for an easy way to get rid of the stubborn hair dye stains on your carpet? These tiny blots can be a real headache, especially on bright-colored carpets. Unlike other stains, hair dyes are tougher and hard to eliminate. According to the University of Illinois extension, hair dye stains should be treated as soon as possible because the longer they stay untreated, the more stubborn they become. But the question is, how will you go about it? Let me share my own experience here below. I used to abhor a negligible splash of fruit juice on my carpet until a tin of brunette hair dye accidentally fell on my cream carpet and repainted it. I actually contemplated between replacing it with a new one and taking to a launderer. However, these two options would cost nearly the same. I, therefore, decided to clean it on my own and I had to struggle for days without any success. I had to sit down and do a thorough research on how I can do this without much pain. During my research, I learned new tricks for eradicating tough stains on my carpet. At least, the methods are cheaper, takes up less time and the requirements are available in the household. Here is my complete do-it-yourself tutorial on how to get hair dye out of the carpet. This section of our guide will cover all the materials and tools needed to remove hair dye out of the carpet. However, there are numerous materials and tools you can use for this task that we cannot include all of them in this guide. We will start with materials and tools, which will be used for my favorite method, then list the tools and materials that can be used in alternative methods. The ingredients above are the general requirements when managing hair dye stain. In most cases, wet stains are easy to eliminate, unlike dried hair dye stains. If the above ingredients don’t work out and the dye persists, you might need to try a different method. You need to take maximum precautions when working with this poisonous substance. I recommend that you work in an open place or a room with sufficient ventilation. Ensure that you try out the cleaning solution in a small hidden spot on the carpet before applying it in the affected area. This will assist you to know whether the cleaning ingredient is destructive to the carpet. 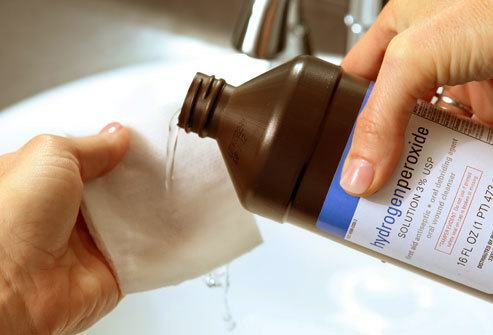 Hydrogen peroxide should be your last resort. It is highly reactive and might discolor your fabric. If your fabric is delicate or you are unsure if it can withstand the chemical, you better consult a professional before using it. Ideally, you should test a drop of the hydrogen peroxide or ammonia on a hidden part of the carpet and observe the changes. 1. Prepare a solution of white vinegar, dish soap, and water. Mix the two cups of lukewarm water with a tablespoon of dish soap and white vinegar. This process will create a cleaning solution that’s perfect for mild hair dye stains. Use a clean cloth to blot up as much dye as you can before you apply the cleaning solution. By doing so, you’ll eliminate some of the dye and concentrate on the tough ones. 3. Dip a clean cloth in the solution and dab the spot. Pick another clean cloth, dip into the cleaning solution and gently dab on the spot. Avoid rubbing or scrubbing the surface since these actions may either damage it or spread the stain deeper. 4. Blot the area with both dry and wet cloths interchangeably. Use a dry cloth to blot the area. Make sure to alternate between the two rugs until the stain is out of sight. The wet cloth loosens the dye while the dry one soaks it up. Repeat the process until all the traces of the dye stain disappear. Once the stain is washed off, dip a clean sponge in cold water and wet the spot. Use a clean rug to soak up the water, once more. Afterward, allow the carpet to dry. Up to the last step above, your stain should have disappeared. However, this might not be the case. If there are some traces of the hair dye, consider the following step. 6. Dab the area with alcohol. Dip a sponge into alcohol and dab the hair dye stain. Continue blotting the area until the stain disappears. 7. Rinse with cold water. Using a clean cloth, wash the area with cold water and air-dry the carpet. I strongly recommend using white vinegar because the ingredient is not as poisonous as ammonia. I, therefore, consider this ingredient safer to use compared to ammonia. White vinegar is also a better option compared to hydrogen peroxide. Hydrogen peroxide is highly reactive and might decolorize your fabric. If your fabric is delicate or you are unsure if it can withstand the chemical, you’ll need to consult an expert first. You should always refer to your carpet care guide before you proceed with cleaning. This is because; different carpets are made of different materials, some of which are delicate. During the laundering exercise, avoid rubbing the carpet but rather dab it. Rubbing tends to destroy the carpet fibers and may spread the stain further. Try as much as possible to get rid of the hair dye stain before it dries up. If the above steps could not get rid of the hair dye stain, don’t fret. There are some more efforts to try. In this case, we shall use ammonia, rather than vinegar. You should take maximum precautions when handling this poisonous substance. Ideally, you should work in an open place or a room with enough ventilation. 1. Form a cleaning solution with ammonia, dishwashing detergent, and water. In a bowl, mix a tablespoon of ammonia, a teaspoon of dishwashing soap and two cups of warm water. 2. Dip a sponge into the cleaning solution and blot the dye stain. Dip a clean cloth into the solution. Wring it to prevent soaking the carpet and apply to the stain. Due to the reactive nature of ammonia and its pungent smell, you can work with gloves. 3. Allow the solution to work in the area for 30 minutes. Leave the solution on the spot for the next 30 minutes. Set a stopwatch while ensuring that the area gets no external interference. Seclude the area and ensure it is out of the way of your pets or kids. 4. Keep blotting the area with more ammonia solution at intervals of 5 minutes. After the 30 minutes, continue dabbing the hair dye with the ammonia solution but have it settle for just 5 minutes. Repeat this until the stain disappears. Once the stain is completely eliminated, clean the area with cold water and allow it to dry. Make sure to try out the cleaning solution in a small hidden spot on the carpet before applying it in the affected area. This helps you to know if the cleaning ingredient is destructive to the carpet. Woollen, silk and antique carpets are very delicate and may require professional services. Ensure to have enough ventilation when using ammonia-based solution. This reagent is very poisonous. If the hair dye stain is tougher, both the first and second methods may fail to work. However, you still got a chance with hydrogen peroxide. This ought to be your last option because it is more likely to discolor your carpet. 1. Apply hydrogen peroxide on the spot. Using an eye dropper, apply a few drops of hydrogen peroxide on the stain. Ensure you concentrate on the spot, without touching the rest of the carpet. Alternatively, you can apply the chemical using a teaspoon. 2. Leave the chemical on the stain for 24 hours. Allow the hydrogen peroxide to work on the hair dye stain for the next 24hours. The area should neither be interfered with nor touched. 3. Blot the area with a wet cloth. Dab the area with a wet cloth, while pressing gently. Ensure you soak up all the stain before air-drying. Try out the color on a hidden part of the carpet to compare specificity. Using the fabric marking pen, apply the actual shade in light strokes. Continue smearing the shade until it is complete. Allow it to dry. If the color isn’t enough, you can smear some more. Hairspray is also an alternative when washing off the stain. The acetone or alcohol ingredient in the spray is responsible for lifting the dye off the stain. The procedure involves wetting the spot with hairspray and leaving it to soak for five minutes. You can then dab the stain until all the traces disappear, before washing off with cold water. Note that, some hairsprays such as Alberto V05 are very efficient but may interfere with the original color of your carpet. Therefore, it is wise to test on a hidden area of the carpet. If the cleaning solution discolors your carpet, use a felt-tip fabric marking pen to re-colour it. Ensure to use light strokes with the right shade. There’s no more worrying about the hair dye stains in your white or cream carpet. If you are the kind of person who would take the carpet to the launderer, my tutorial has guided you on how to solve it yourself. The best thing about this method is that you will access all the requirements of your house. Considering that I’ve listed up to three ways to clear up the hair dye mess, you can use all other options when one fails to work. As I wrap up this guide, I’d like to ask, did you enjoy my tutorial? Did you find it interesting and helpful? If yes, share this post and you may help someone. You can also drop your comments and share your own experience. The aim of creating this guide is to help people who are in an exactly similar situation as I was. Recently, a tin of brunette hair dye accidentally fell on my cream carpet and repainted it. This was awful, right? I struggled for a couple of days trying to clean up the mess but I couldn’t get it right. I don’t want people to suffer the way I did and that’s why I created this post. To wrap up, I value your feedback, so if you have any question or comments feel free to leave them here below.